We're a minor touring market, geographically isolated from the rest of Canada. Most "Canadian tours" don't trek east of Montreal and, if they do, it's usually at the very end of a touring cycle or a couple decades past the artist's prime. (The biggest show at our civic arena this summer? Alice in Chains.) We had a municipal scandal three years ago around the city throwing money at promoters to try and attract "world class" acts here. And when bands or festivals do come through, they're often of the riff-rock, dude-dominated variety. Great local acts and promoters do their best, and the Halifax Pop Explosion is like a weeklong alternate reality each year, but sometimes my city feels stuck in a musical time warp, twice removed from what's cool. I don't mean this as a sob story — it's basic concert economics, really, and many other urban centres have more cause for complaint than we do — but it's crucial to appreciating the rare energy that greeted St. Vincent's set at the Halifax Jazz Festival last night. This isn't the sort of show that typically comes to Halifax: an artist — a female rock artist, no less — at the peak of her power and popularity, having just released arguably the best album of her career to massive acclaim and a much wider audience. Hell, when the show was announced on April 1, of all days, I accused a fellow writer of partaking in an especially cruel April Fools' joke when sharing the news. For once, Halifax wasn't getting musical table scraps; we were being invited to the dinner table. The capacity crowd was already eager and fevered (particularly those close to the stage) when Halifax's the Heavy Blinkers started their opening set. A Blinkers show is a rare treat in and of itself: the orchestral pop group is the brainchild of songwriter Jason Michael MacIsaac, featuring music that requires a good deal of instrumentation and guest vocalists to pull off. With Stewart Legere and Melanie Stone's pitch-perfect harmonies taking centre stage, the band pulled off a swoon-worthy set featuring songs from last year's excellent comeback record Health, lost classics from the early 2000s like "I Used to Be A Design" and an on-point cover of the Beach Boys' "Don't Worry Baby." Those swoons turned to screams as, after a slight delay, St. Vincent took the stage and unleashed a three-song opening salvo that ranks as one of the best starts to any concert I've seen in recent memory. 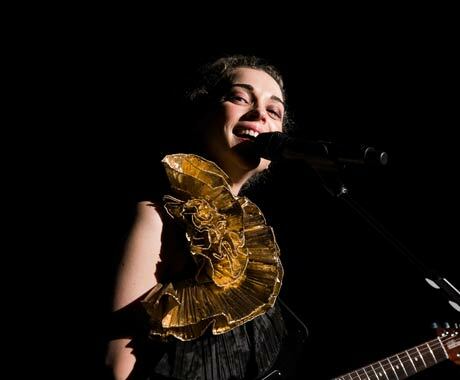 I'm half convinced Annie Clark and company could have walked off-stage following colossal takes on "Rattlesnake," "Digital Witness" and "Cruel" and the crowd would have gone home reasonably satisfied. Thankfully, there were still 11 hypnotic, guitar-assaulting songs to come in a set that skewed heavily towards 2014's self-titled album but offered a smattering of tracks from her first three records for good measure. The show was built on marvellous tension between calculation and spontaneity: between each choreographed stage move was a guitar solo or vocal run that had a true spark of presence and immediacy. In lesser hands, Clark's hyper-theatricality could come across as phony, but I found her dramatics incredibly compelling. During a three-song mid-set run of "Surgeon," "Cheerleader" and "Prince Johnny," she took to a large platform at rear-centre stage, holding court like a confident-yet-conflicted queen, exuding both awesome power and deep melancholy. The visual experience was matched by the awe-inspiring sound, as the sheer physical force of Clark's guitar tone ripped through the speakers on songs like "Huey Newton" and "Regret." Though she's clearly learned some stage moves from David Byrne, and recently performed with members of Nirvana at the band's Rock & Roll Hall of Fame ceremony, the artist Clark most reminds me of is Prince. Her sexuality is subtler, and she's more art school than Minneapolis street — okay, a lot more art school — but she offers a similar mix of R&B rhythms, guitar virtuosity and can't-look-away charisma. Check out a classic Prince performance on YouTube (if you can find one he hasn't had removed) and watch the way his eyes seem to balance generosity and intrigue; they tell a story alongside the songs, but it's a narrative that's loose and mysterious. Likewise, even when Clark was in the midst of a fingers-flying guitar solo, it was her eyes that held sway, darting in an instant from joy to mischief to empathy. Just when you thought you had a read on her, she'd swerve again and the entire emotional experience swerved with her. From where I was standing, the crowd ate it all up, so much so that when the show ended seemingly without an encore everyone stayed in place, still cheering. (Show-closer "Your Lips Are Red" was actually listed on the written setlist as an encore song, but the band launched into it without leaving the stage.) Even as the lights came on, and the house music kicked in, the keeners at the front of the stage resisted the Pavlovian response to leave, only departing after several minutes when festival staff took to the mic to shut things down for good. They wanted more and, after what will go down as one of the more memorable Halifax shows in recent years, I was right there with them.